1. How can your books be used to teach a love of art (Mousterpiece) and performing (Four Seasons)? I have been told that both are perfect venues to teach the love of art and music. All I can say is that if you do something that it meaningful, write about it, and it comes through to the reader, then in essence, it teaches a lesson and shows without telling in a heavy-handed way what it means to be an artist, to do what has meaning in life, to make a life of art. Art was always my life since I was little. I think that comes through in Mousterpiece. It is who I am. It is who the little mouse, Janson, is. She discovers what it is to be a true artist. I also played the piano as a child. In the same vein, Ally, the main character in Four Seasons: A novel in four movements based on the seasons of Vivaldi’s sonata, is a child piano prodigy at Julliard in New York City and learns to discover, like Janson, (I just realized this link!) what it means to be a true artist for herself. I was not a child prodigy, but my younger son went to Juilliard as a violinist and composer for nine years as a child so I knew my “material” to say the least. 2. What do you see as connecting threads in your work? The common thread is emotion. I do not avoid inner feelings and how people interact or relate to each other, whether it is for young children or young adults. We are complex human beings whether we are three or eighty-three. Some of us just choose to forget or deny the inner workings of who we are. I like to tap into and remember those feelings of separation anxiety or fear or heartbreak, and of course, empathy and love. 3. How does your work as an artist inform your book publishing? Well, I am an artist – a painter – who happens to do books and am passionate about the form and structure of a book as an art object. I loved slip-cased books, books tied with silk ribbons, ragged thick paper on the trim, marbleized endpapers, embossed cloth bindings, vellum over a title page – that is why I originally fell in love with bookmaking. Of course books look different now, and that challenge I appreciate as well. Every detail down to the spacing of the typography on the page. Now, I like experimenting more in a book. With both the ideas and the materials used. I have done work on the computer, overlays like an animation, mixed media, collage, but in the end for me there is nothing like the water color on a gorgeous piece of paper painting with a triple zero brush taking my time with my nose to the surface for hours hunched over a drafting table! I consider it “serious business” and don’t take lightly the years spent on creating a book. I have done around 50 books – all kinds – and I like to push myself as an artist and a person to experiment and challenge myself to do something I haven’t done before. To grow. 4. Do you cross-promote the two? I try, but it is almost like two different fields with different editors with their own passions. Some are better at novels, while others at a shorter form. I love music. Many people have mentioned it enters a lot of my work, in timing, space and intensity. I have used it in both age groups – novels and picture books. Sometimes people know me as a young adult / middle-grade author, and most know me as a picture book author/artist. I began my life as an artist, but felt I needed to say more so I began to write novels when my children were little and napped. I had stopped doing picture books for a few years to get away from all that! They no longer are small; I feel even more intense now about writing novels. The link between the two is that in a novel you are there visually with the characters, and in a way, it is like doing art. I disappear into another place that feels real in that fictional world. I love being in it and feel consumed by writing the story when I am working on a novel, like Four Seasons (Knopf 2011) which took about 3 or so years, and Leap (Knopf) before that, which I developed into a screenplay – another visual form with dialogue. I have had eight published between doing the picture books. 5. Is there an art technique you’ve learned recently that you’d be willing to share tips on? I have experimented so much in these last ten years with so many different techniques that I find it actually interesting. I get bored when I look at some illustration work and the style is the same again and again. For me, it personally shows no growth. I know people often want the same old thing from an artist, but for an artist, that is not always exciting. What is exciting is the journey, the process of working, revising, and knowing there is never an end because even when the book is done, it could always be redone in another way. There is a time though, you have to say, move on to the next one. As a former art director, teacher at the School of Visual Arts, chair of the Society of Illustrators, I can say I have seen a lot of techniques, and in the final analysis the tip is what works for the individual. There are no rules. The key is to wake up and do what you love and keep trying to make it better. I think that is the plight of the artist. The process. The work. The time alone in a room to create. 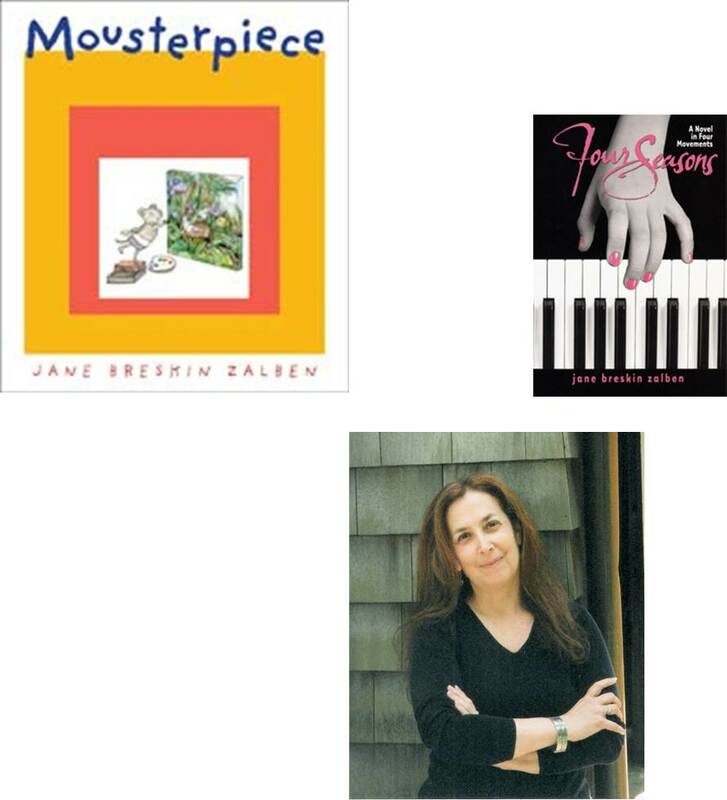 Jane Breskin Zalben the author/artist of more than 50 children’s books. She’s just published “Mousterpiece: a mouse-sized guide to modern art,” which is receiving starred reviews. Her young adult novel, “Four Seasons” had jacket blurbs from Judy Blume and Gordan Korman and fan e-mails from Bunnicula author, James Howe. She travels around the U.S. and abroad to talk about her children’s books.